Three different-colored T-shirts combine to result in a handy rug that brings color to a room with this DIY project. 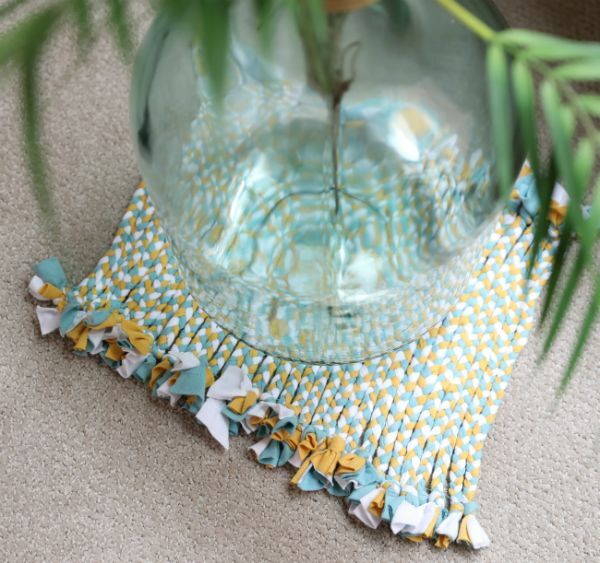 Because they're small and portable, you can toss these rugs anywhere in the home. Most T-shirt material is absorbent, so these rugs work well in a bathroom or kitchen, where water might splash on the floor. Make even smaller versions to place underneath potted plants to catch water leaks and protect wood surfaces. Because these rugs are not woven, keep them out of reach of children who might slide them over their heads; the rug could get caught on something and pull. 1. Place the T-shirts on top of one another and smooth flat. Place the ruler horizontally across the front of the top shirt, just below the armpit seams. 2. Draw a line all the way across the T-shirt. Cut across the line, making sure to cut through all three shirts. Smooth out the fabric. 3. Cut the shirts vertically into 2-inch-wide strips. Separate each strip. Layer three pieces of fabric – one of each color – to create trios. Continue creating these multicolored strips until you run out of fabric. 4. Tie one end of the strips into a knot. Repeat this for every tricolored strip. 5. Tape one knotted strip above the knot to the work surface. Separate the three fabric strands. Tightly braid them together: right over center, left over center, right over center etc. Tie a knot at the end. 6. Repeat Step 5 for all tricolored strips. 7. Line up the braids next to one another, knots touching, on the work surface. Thread the needle with thread twice as long as the width of the group of braids. Tie a double knot at the end of the thread. 8. Draw the needle through the left braid just above the bottom knot. Tie a double knot in the thread. Draw the needle through the next braid just above the bottom knot. Tie a double knot in the thread. 9. Draw the needle through the remaining braids in the same location. Do not knot the thread until you have drawn the needle through the last braid. Trim the thread. 10. Draw the needle through the right braid just below the top knot. Tie a double knot in the thread. Draw the needle through the next braid just below the top knot. Tie a double knot in the thread. 11. Draw the needle through the remaining braids in the same location. Do not knot the thread until you have drawn the needle through the last braid. Trim the thread.